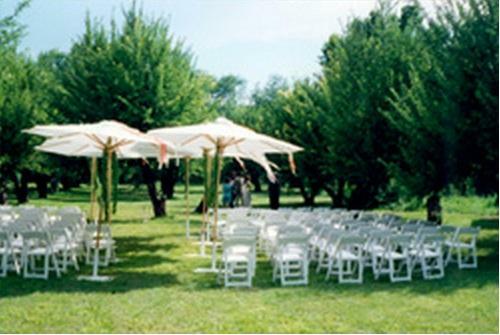 Rent Rancho Manzana B&B | Corporate Events | Wedding Locations, Event Spaces and Party Venues. A unique and cozy Bed and Breakfast in the historic rural community of Chimayo, just a short drive from Santa Fe. An "eco friendly" establishment; we serve piping hot breakfasts in the morning, using farm fresh and organic ingredients. he outdoor setting is magnificent, especially during the summer and fall. Guests are always enchanted by the surroundings. For a large party we can accommodate groups as large as 125 people or we can design an intimate dinner for a small group. A summer meal served outdoors under the ramada is a truly magical experience. We have access to a number of professional caterers and can assist you in planning all your special occasions - large or small. We can also assist in the coordination for floral arrangements, babysitting and transportation services, and more.